Is This the Hunley Lantern? I nterpreting finds in their historical context is an important part of archaeology. This often requires going to historical records, other field reports, or museum collections. Sometimes identification is made in unexpected ways. 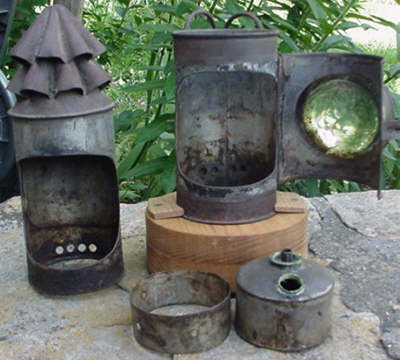 One of the most anticipated artifacts has been the lantern whose blue signal light was seen from the shore and from the Housatonic the night the Hunley disappeared. 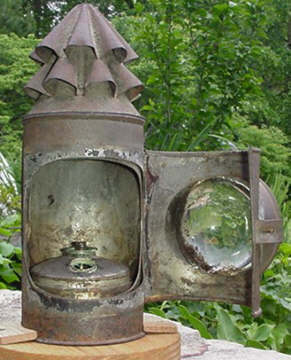 Soon after The Friends of the Hunley released an x-ray image of the concreted lantern found in the commander's station, Barry Rogoff discovered an antique maritime oil signal lamp for sale on e-bay. The color photographs are courtesy of Virgil Robinson, who bought it. The 7½-inch tall lamp is a striking match for the x-rayed object. The side view show similar proportions and details for the lamp body. The door ridges and the hinges match, as does the glass lens. Even the double-walled construction is discernable in the x-ray. The only apparent difference between the handles and handle mounts is that the x-rayed handle appears to be broken. The oil reservoir in the x-ray matches, but is clearly askew, upside-down. Virgil says the tank sits loosely in his lamp, as shown in the photo below left, and could easily be inverted if handled roughly. Both lanterns have fluted tops, but that in the x-ray appears considerably shorter, possibly with an additional layer, the only significant difference between the two. As the photo above left shows, the top and inner sleeve are a separate part and might represent a variation on the basic design. More research by Virgil and others has revealed the possibility that the lantern was fueled with whale oil. 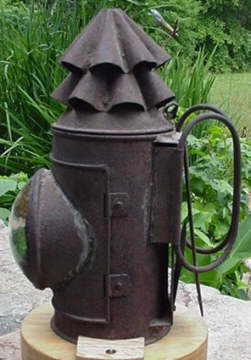 Somewhat smaller lanterns of similar design were used in the field during the Civil War. 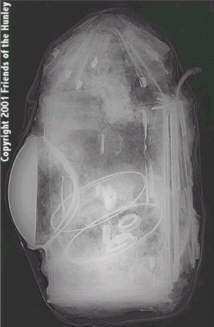 A sample had a shorter top like that in the x-ray, but a very different case and a hemispherical reservoir. Although we've seen very little information about the Hunley lamp, I have no doubt it is very like the antique pictured here. Except as noted, this page and its contents © Copyright 2001 Michael & Karen Crisafulli. All rights reserved.